Hungarian mathematician; born Dec. 16, 1849, at Raab. He entered the University of Vienna to study medicine, but being more interested in mathematics, he went thence to Heidelberg, and studied physics with Helmholtz and mathematics with Königsberger. Here he took his doctor's degree with the thesis "Ueber die Elliptischen Modulen" in 1870, producing in the same year the work "Beiträge zur Theorie der Electrischen Nervenreizung." König then went to Berlin to attend the lectures of Kummer, Kronecker, and Weierstrass. 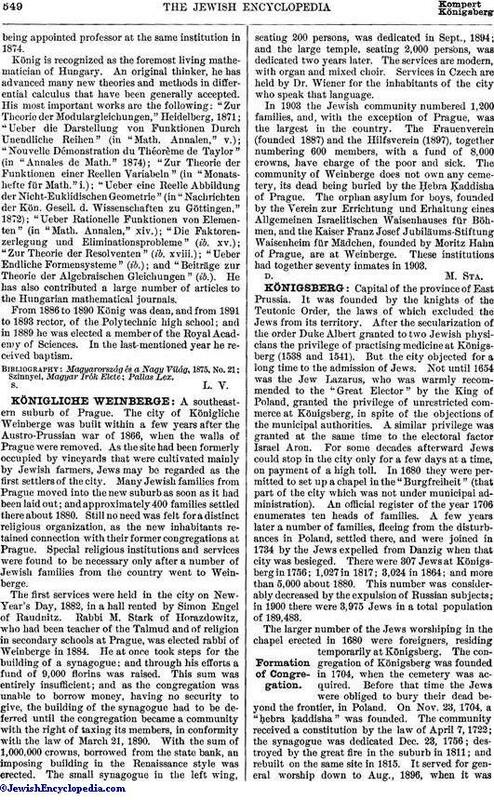 Returning to Budapest in 1872, he became privat-docent at the Polytechnic high school,being appointed professor at the same institution in 1874. König is recognized as the foremost living mathematician of Hungary. An original thinker, he has advanced many new theories and methods in differential calculus that have been generally accepted. His most important works are the following: "Zur Theoric der Modulargleichungen," Heidelberg, 1871; "Ueber die Darstellung von Funktionen Durch Unendliche Reihen" (in "Math. Annalen," v.); "Nouvelle Démonstration du Théorème de Taylor" (in "Annales de Math." 1874); "Zur Theorie der Funktionen einer Reellen Variabeln" (in "Monatshefte für Math." i. ); "Ueber eine Reelle Abbildung der Nicht-Euklidischen Geometrie" (in "Nachrichten der Kön. Gesell. d. Wissenschaften zu Göttingen," 1872); "Ueber Rationelle Funktionen von Elementen" (in "Math. Annalen," xiv. ); "Die Faktorenzerlegung und Eliminationsprobleme" (ib. xv. ); "Zur Theorie der Resolventen" (ib. xviii. ); "Ueber Endliche Formensysteme" (ib. ); and "Beiträge zur Theorie der Algebraischen Gleichungen" (ib.). He has also contributed a large number of articles to the Hungarian mathematical journals. 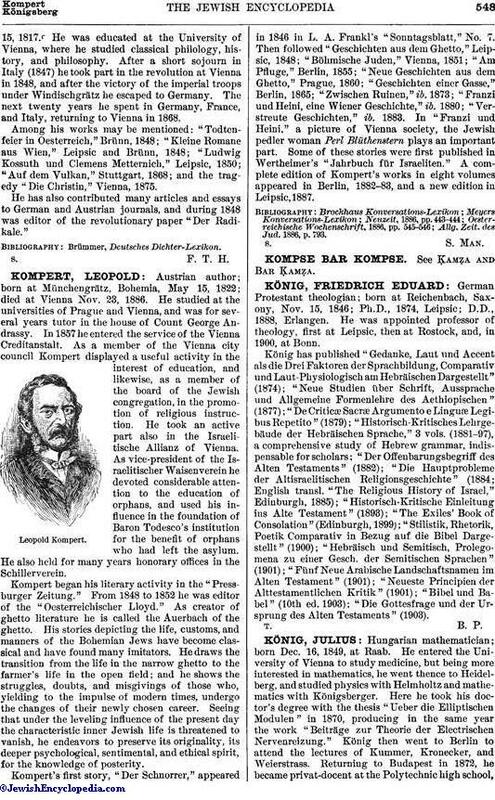 From 1886 to 1890 König was dean, and from 1891 to 1893 rector, of the Polytechnic high school; and in 1889 he was elected a member of the Royal Academy of Sciences. In the last-mentioned year he received baptism.